In many Internet companies, log data and user features are generally stored as wide tables in columnar formats in HDFS. By reordering the columns and/or duplication of frequent accessed columns in the physical layout of a wide table, I/O performance of query workload on the table can be boosted by more than 50%. Paper on this work is accepted by SIGMOD'17. We introduce a system called SEED which is designed to support entity search and exploration in large Knowledge Graphs. We demonstrate SEED using a dataset of hundreds of thousands of movie related entities from the DBpedia Knowledge Graph. The system utilizes a graph embedding model for ranking entities and their relations, recommending related entities, and explaining their interrelations. Log data contains valuable information for decision makings. Timely and efficiently analyzing of log data can bring significant business value. For example, by analyzing log data of servers and applications, we can infer root causes of failures. By analyzing log data of e-commerce sites, we can learn recent changes in browsing and purchasing behaviours of specific customers. Based on that, e-commerce sites can provide more personalized recommendations. 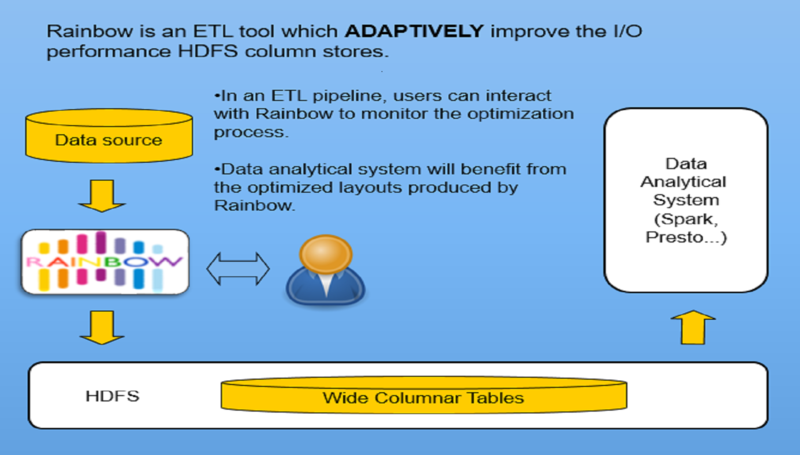 We present a data layout optimization tool called Rainbow, which leverages workload-driven layout optimization algorithms to adjust data layouts adaptively without intervening the previous data blocks that have been stored. We also provide a Web UI for users to interact with the layout optimization process. In ESearch, we design an efective ranking model of entity types to facilitate blind feedback and user feed- back on desired entity types for category matching, so that users can efectively perform entity search without the need of explicitly providing any query entity types as inputs.